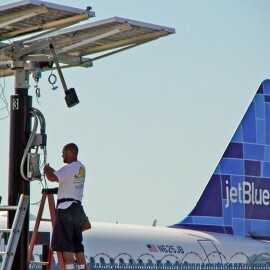 Long Beach Airport Solar Project with solar electric trackers by Suntrek Industries. The bottom line is you want to use a solar energy company that has been in business for a long time because that means it has the experience and customer following that prove its expertise. Suntrek Solar is such is company. The fact is that the solar energy industry in California is flooded with solar energy companies. Most came into the market during the solar rebate and tax credit era over the past decade. They saw an opportunity to get into the solar business because of a growing environmental consciousness and the growing demand for clean, lower cost energy. But over the years, many have floundered and many have gone out of business. Others are teetering on the verge of financial collapse since they work from job-to-job instead of having a long, successful track record. That leaves you with a few choices that are worthy of the most consideration. 1. Have they been in business doing solar only for over 20 years? 2. Do they have any complaints on their contractors license that have not been resolved? 3. Do they hold a valid license, liability insurance, and workman’s compensation insurance? 4. Do they have high profile clients who have vetted them in every way? 5. Can they provide references that have similar projects as yours and are in your area? 6. How did you hear about this company? Were you solicited? If so, do you really want to do business with a company who you were not personally referred too? Suntrek Industries is going into its 26th year of doing business with over 25,000 customers. Suntrek relies 100% on referral business.